The Gay Gamer: Anyone up for another PSP-focused post? I hope so, because here's another one. I also picked up this import-only PSP release some time ago, by the way--after someone on Twitter made me aware of its wonderful box art (which can be seen in the photo below). 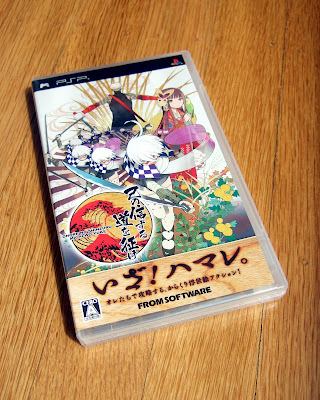 The game in question is Onore no Shinzuru Michi wo Yuke, a ukiyo-e-swathed puzzler (of sorts) that was developed by Silicon Studio and published (in 2009) by From Software for the PSP. I can't tell you much more about it than that, though, because I've yet to play it. (Of course!) I'll do my best to rectify that in the coming weeks, and if I do I'll try to share some impressions of it here. I do mind, Sam! Actually, I'm just kidding :P Thanks! Do you still need a stego skull in Animal Crossing: New Leaf because if you do I have one.I'd be willing to trade it for an extra Varia suit shirt but if you don't have an extra one or just don't want to give me one I'll give it to you for free. Also Terry give me a T. Rex tail so I don't need one anymore. I also recall that you were talking about possibly gay villagers, in my town town there's a male smug horse named Colton that I think he's Bi since he talks about girls but when he was at a K.K. Slider live show he was made a comment about him being cool, a celebrity, and a trend setter and another comment he said that he had a brave spirit. Colton did the "love" emotion when making both these comments. He also acts lovey-dovey towards me. Sorry for posting this in a non AC post, I just wanted to make sure about the stego skull and I kind of just added to it, I'll try to stay on topic starting now. Yes, many people (outside of Japan, especially) hated on the PSP over the years, but I, too, though it was a great little system. 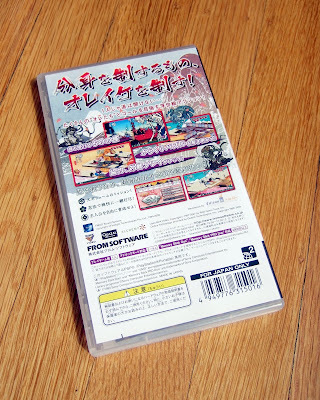 It offered some great games--many of which complemented the kinds of games that were released for the DS. Sam: don't worry about staying on topic. Sure, I guess I might care if everyone was off-topic all the time, but once in a while is completely fine with me. I am almost 100 percent positive I have an extra Varia suit shirt I can give you an exchange. Let me look the next time I'm on and then I'll let you know here if that's the case or not. Assuming it is, we'll have to set a day/time to meet up, as I don't think we're NL best friends (or are we?). As for New Leaf's gay characters: honestly, I was kind of kidding when I wrote that. That said, the characters do say some interesting things from time to time, and I wouldn't put it past the folks at Treehouse to put in some gay references, etc., so who knows? Update: I definitely have an extra Varia suit shirt, Sam, so just let me know and day/time that would work for you to connect and we can exchange our goods! Thursday or Saturday would be good but any day might possibly be good since work hasn't been very demanding to me lately. According to my Google results the time zone I'm in is 2 hours ahead the one you're in (you're in Seattle right?) so just tell me a time that works out for you in you're time zone and then I'll just add to that to know when I should go on (like if you said 5 then I'll know to go on at 7) then I'll tell you if that time works for me or not. Also should I visit your town or should we do the trade at my town. If we do this at my town I want you to know that I might have my house set up for HHA points and not how I want it to be set up. If the ballon set is in the back room than that means I have it set up for HHA points. Also do you need a the solemn painting because I might have a real third one because I keep getting them. Let's try for Thursday, Sam, as I'm sure to be busy on Saturday. I can meet up at pretty much any time that day/afternoon/night, by the way, as I work from home/for myself and I don't have any scheduled phone calls (interviews) that day. Maybe we should try at 5 or 6 pm my time (yes, I'm based in Seattle, so Pacific time zone) on Thursday? Oh, and why don't I visit your town? I'd love to see it--regardless of what state your house is in. You can always visit my town next time, if you'd like. It's definitely undergone some changes since you last visited! Both times should work but 6 (your time) will probably be the best bet since at 5 (your time) I might be cooking or eating dinner then but if I can I'll log on then and open my gate. As for my house I'm going to put it back in it's "true form" when it reaches 100,000 HHA points. Also if your town has a spot left for a resident you can have Joey (a lazy duck wearing a diaper) if you want him you can have him. There hasn't been word if Hes thinking of moving but I like my other lazy villager more and I want a resident that I've had in any of the previous AC game or Pierce or a reptile I that really like since I don't have any reptiles. Let's go for 6 pm Pacific time on Thursday then, if that will work best for you. My mayor's name is Sam and my town's name is Kakariko. If you see a flag with this ( http://monsterhunter.wikia.com/wiki/Rathalos ) Monster Hunter monster on blue background and MH written next to it then you're in the right town. Also my mayor has green spiky hair and blue eyes if that helps. I'm actually kind of excited to show off more people my town even if it's still very much a work progress. As for my house my bedroom room is the only one I didn't change for the HHA incase if I haven't score 100,00 by then. the back room is the only one that's been heavily changed as the others were feng shuied and the one of the items from the basement was moved to an other room since the basement isn't included in the score.